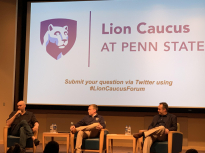 UNIVERSITY PARK, Pa. - This Tuesday, The McCourtney Institute for Democracy and The Donald P. Bellisario College of Communications welcomed E.J. Dionne, politician, author, and journalist for The Washington Post. In his lecture, Dionne discusses his ideology behind the future of American democracy depending on empathy among the American people. Many of Dionne’s ideas are showcased through his bi-weekly column for The Washington Post. Penn State Sophomore, Gabby Coral, head of his columns and was eager to learn more. “I’m looking forward to hearing about his bi-weekly column, the books that he’s written, and his political stance and how that has influenced his work,” Coral said. Regardless of a person’s political stance, many people in the audience soley went to the presentation to hear a politicians point of view. 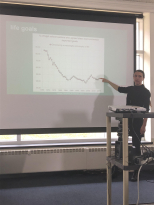 Sophomore communications major Lauren Smith wrote a research paper on Dionne for her communications class this semester and shared what she found interesting about him. Not only does Dionne provide his input through lectures and columns on The Washington Post, but he is also the author of the novel “One Nation After Trump.” The Penn State BookStore had copies of his book at the lecture for the public to buy or learn more about it. Grace McCarthy is a freshman majoring in broadcast journalism. To contact her, email gem5279@psu.edu.